The Accupoint epitomizes quality in weighing measurement devices. Incorporating top level protection while maintaining performance specifications, the Accupoint improves safety whilst reducing load cell damage and plant down time. 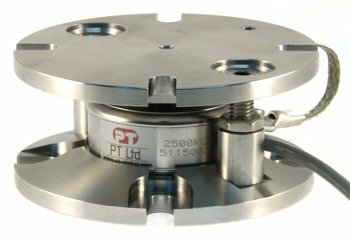 Manufactured of stainless steel with special long life hardened contact points, the Accupoint Weigh Module® includes a high precision stainless steel mini disk load cell sealed to IP68. Well suited for outdoor and harsh environment operations, these units provide years of high precision weighing with minimal maintenance. Popular installations include vessel weighing in food processing plants such as dairies as well as chemical and bottling plants. Also ideal for use on tanks and silos in the agricultural industry; the Accupoint is a versatile weigh module. Available in nine capacities from 100kg to 25t, with typical weighing options up to 200 tonnes in a standard four support vessel. Add a digital indicator and summing box for a care free complete kit for your installation or use as a stand alone module. Either way, every Accupoint is a self contained weigh point with built in side and uplift restraints for easy installation, only requiring bolting into place.